For a treat this is a good place to go! Korean BBQ at its best! BBQ your food at the table, makes for a novel and fun way to eat. 3 set menus to choose from. it's a meal and an experience. 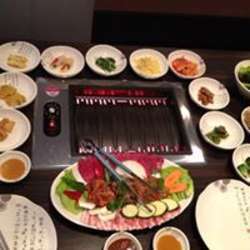 The service is good and the waitress explain how to cook and eat the various meats and side dishes. Please just register only if you can come and don't hold the slot and let the others have the chance to join the group. Kindly unregister three days before if you cant come but please leave a message that would be nice alright! Were both looking forward on meeting you in the heart of Cologne City.